This post is hard to write. After 14 years together, and only 5 months into this blog, we are calling it quits. No, not our marriage. We are calling it quits on our effort to reign simultaneously as primary parent in the same moment. We are still going to share primary parenting, but we are splitting up our calendars in an attempt to increase ours and our kids’ sanity. Much like we initially approached sharing primary parenting with an attempt to both be involved in everything, sharing tasks 50/50, we’ve approached daily life by trying to achieve 100%, both of us being the primary parent when the family is together. The problem we’ve found is that when we’re both in primary parent mode at the same time, it’s confusing to us and to the kids who’s in charge. And it’s taking a toll. We find ourselves in frequent unnecessary and nitpicking arguments about minor things like whether blueberries should be served before, during, or after a given meal (yes, that’s a real argument we’ve had). These constant back-and-forths have taken their toll on both our relationship and on our kids. It doesn’t feel good to be constantly questioned by your partner. And lately, when the kids hear us having even the calmest of disagreements (like the one over the fruit), they quickly admonish us to get along. We don’t want our home to be filled with arguments. We don’t want to have or role model a relationship rife with nitpicking. And we definitely don’t want our kids worrying that we don’t get along or don’t love each other. Some months ago we split up household chores – switching off weeks of dog duty and dishes duty. It’s worked really well. This simple scheduling trick has eliminated countless back-and-forths about whose turn it is to do what and who’s done more or less of the household chores lately. It’s removed a layer of angst from our relationship that we didn’t even realize was there until it was gone. So we’re splitting up. We haven’t sorted out all the logistics yet. A simple calendar split – one parent does mornings, one evenings; one parent does Saturdays, one Sundays – doesn’t quite work for our lives. And as with navigating sharing primary parenting to begin with, we expect we’ll have to go through a lengthy trial-and-error period before hitting on a split that works for us. So for now, we’re committed to trying different configurations until we find what works. Our first try involves assigning only one of us primary parent for breakfast duty each week and switching from zone to man for the many daily transition times (each of us taking lead on one kid). Wish us luck! 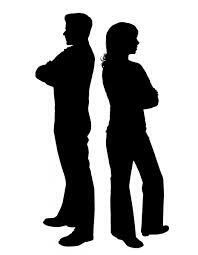 Do you split up parenting duties with your partner? How do you make it work? Yikes! I was just checking your blog since I was happy to see that your little and our only would be in the same class again this year and my stomach did a flip when I saw the title of this post. Whew, scared me for a minute! Rings true, though. It’s likely easier with only one, but the same reality is there regarding rules, structure, discipline and processes. Luckily she is learning to go with the flow of whichever parent is primary in the moment. This is a great idea! I find myself sometimes either giving orders to my partner or being annoyed when he’s asking what he should so ie- should the baby have his nap now? or in half and hour… Will be following your journey on this one.